I love this table cloth idea, it's so simple and so much fun! 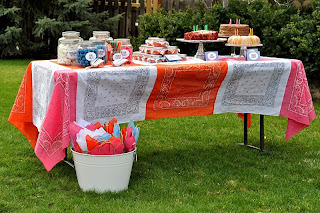 It's from the Aesthetic Nest and what I love about this idea is that you can get your kids involved by simply having them help pick out the colors. If you want to dress it up a bit, think about adding some fringe to the bottom or perhaps just a bright colored ribbon...get creative and have fun! Oscar Time = Party Time!